Rabbit hunting, or rabbiting, is still a common practice today. Rabbits can be the cause of many environmental issues, especially when they overpopulate an area. And wild rabbits are also enjoyed as a unique ingredient when cooking. So for both recreational and environmental reasons, many wild rabbits are caught every year. But getting them out of their holes is not easy, and that’s where the ferret comes in. It would be simple to assume that all ferrets are good at rabbiting, based on their history. After being bred for rabbiting for over 4,000 years, it has only been in the last few hundred years that their usage has gradually shifted to companion animals. 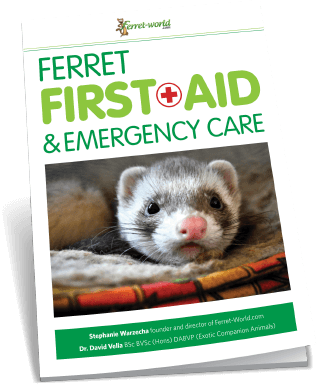 But these recent centuries have made a significant difference to ferrets, both physically and mentally. Choosing breeding pairs for personality, coat colour, and marking, has resulted in a very different ferret. 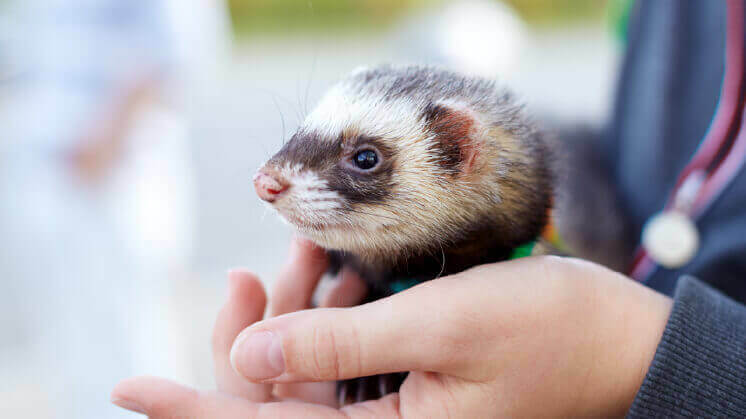 And while some traits like curiosity remain, other issues including their physiology might put them at risk.The ferrets that are used for hunting today are typically bred for it and come from a number of generations, selected for this task. Of all options, ferrets are by far the preferred animal to use when flushing rabbits from their burrows. This is because their unique body structure is more suited to holes and tunnels than other natural predators like cats and dogs. Their vision is also particularly suited to dark tunnels and their sense of smell has not been bred out of them. Both hobs and jills are used, and different hunters have their preference based on the animal’s size, strength and stamina. The main reason some hunters prefer jills over hobs is that the stronger hobs are more likely to kill the rabbit in the burrow and remain down there for a nap. But there is more to a working ferret than breeding. According to Simon Whitehead, a professional rabbit hunter in the United Kingdom, it is useful to cement their prey drive by feeding them fresh rabbit meat with the fur still on during the first years of their lives. He also recommends well socialized ferrets. The first time a ferret is introduced to a burrow, it may be a bit confused by all of the new sights and smells, but soon enough it will find its instinct and go to work. If a ferret does not want to go down a hole, there is probably a good reason. They have a very good sense of smell, and there might be another animal down there like a fox, snake, or wild cat. Before scaring the rabbits out of their burrow, it is important to be ready for them. Many rabbiters choose to use purse nets. They place one over each burrow hole and make sure its guide line is securely pegged down with no escape holes. Other options are long nets, shooting, or using other animals such as dogs or even harris hawks. 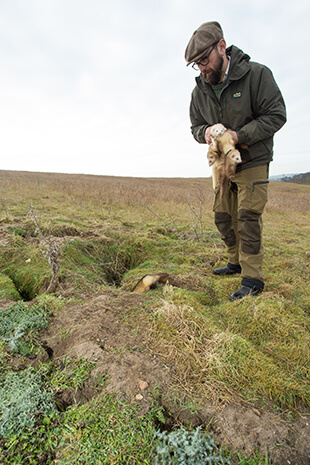 All hunters recommend attaching a collar with a ferret tracker before letting a ferret loose in a burrow. And once they’ve been set to work there could be a long wait before anything happens above ground, think ten to twenty minutes. Then everything can happen in a rush. The rabbits can explode out of their burrows, hitting the nets with force. And then they will struggle to find an exit or chew a hole in the net. So hunters have to work quickly to catch the flushed rabbits and replace damaged nets. Once the rabbits have been flushed out, and the ferrets have come back, they’re counted, and sometimes a ferret is missing. This is when the ferret finder collars are so important. They give off a signal so the hunter can use a device which clicks more quickly as they get closer. Once the underground location of the ferret has been determined, the clicks also give an indication of how deep they are going to have to dig. This can go down to sixteen feet deep. It is unlikely that the ferret got stuck down there. Some rabbits will hide up in a dead end, and when the ferret finds it there, it will not be able to chase it further. Or the ferret might have killed a rabbit and be enjoying a meal and a nap. While it is normal to be afraid that the spade digging out the ferret might injure it, this does not seem to happen. But even so, it is good practice to keep checking where the ferret is as you dig. Even though ferrets are the most effective way to scare rabbits out of their holes, they are not always available for the job. This is because there are concerns about the ferret getting free and having an impact on local wildlife. Laws vary by country, and also by state or county within countries. Because these laws might change, it is best to check for yourself before using a ferret for hunting. And if you are considering learning this craft, be sure to find a mentor because while it might seem easy, there are many more things to learn.